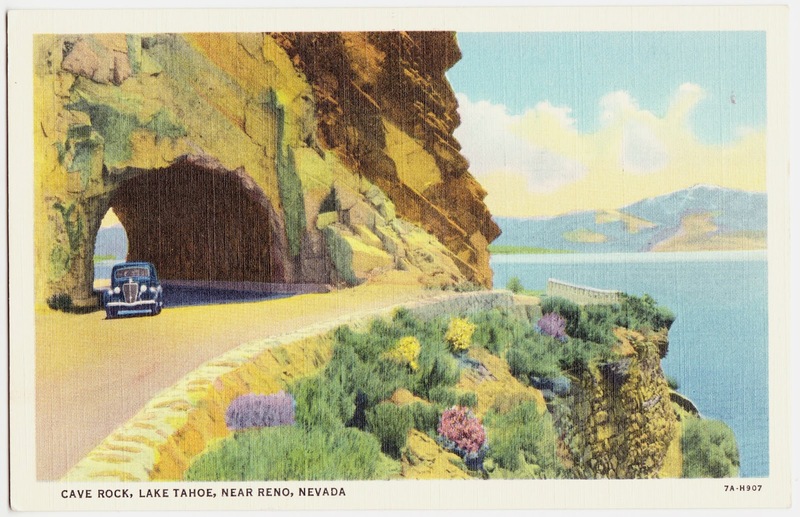 The Cave Rock Tunnel consists of two tunnels along U.S. Route 50; the westbound tunnel (seen on the postcard in an early version) is 153 feet and the eastbound tunnel is 410 feet. The first tunnel was built in 1931, as part of a renovation of the Lincoln Highway. Work on the second tunnel did not begin until 1957. "The Cave Rock area is considered sacred by the Washoe tribe. The Washoe tribal leaders were not consulted about the construction of either bore, and were upset about the perceived desecration of their tribal lands. Within the last decade, the Washoe Tribe has had a larger influence on Cave Rock and its historic preservation. In 2007, the Federal Government ruled on a precedent-setting case that has restricted activities around the tunnel, such as rock climbing." Coincidentally, a $6 million Nevada Department of Transportation project to extend the westbound tunnel began this week. It will continue through this fall. 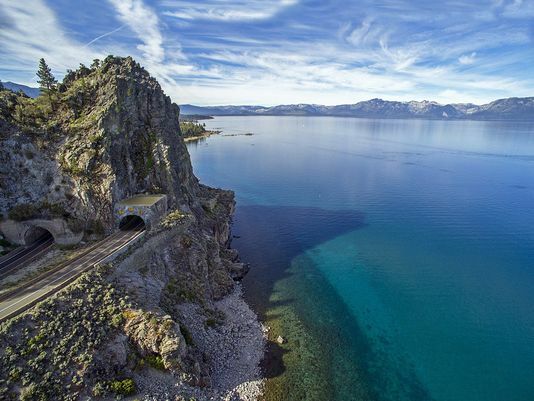 "The Nevada Department of Transportation is taking preventative measures to ensure the future safety of the traveling public within the Lake Tahoe Basin. 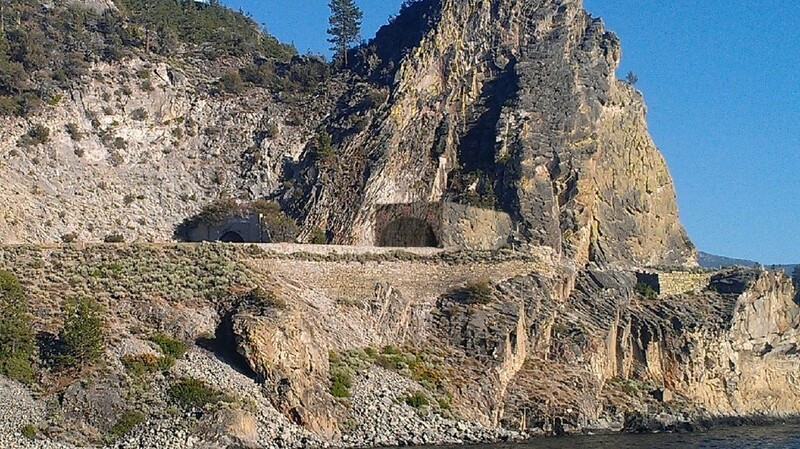 As a result of large scale rock fall that occurred in early February 2015 and due to the threat of large diameter rock fall in the future, NDOT will construct a tunnel extension / rock fall shelter on the north side of the westbound Cave Rock Tunnel. This approximately 60' long, 27' tall, flat-topped structure will protect the traveling public by catching falling rocks all while blending into the natural surroundings with colors, patterns, and textures matching the adjacent rock faces. Additionally, stormwater quality improvements will be made from approximately one mile north of Cave Rock at Milepost 8.4 through Milepost 11.4. Improvements include paved shoulders, new drop inlets, new sediment filtration systems, slope scaling, and barrier rail." 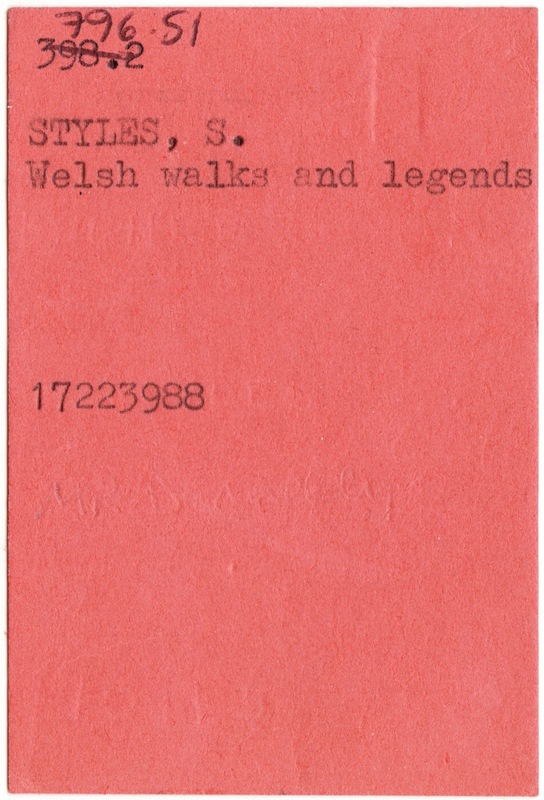 Old library ephemera inside 1972's "Welsh Walks and Legends"
I recently finished reading Welsh Walks and Legends, which was written by author/outdoorsman Showell Styles1 (1908-2005) and first published in 1972. Styles published more than 160 books, ranging from historic navy adventures to juvenile fiction to mysteries (usually with an outdoors theme). He also authored more than three dozen non-fiction books on mountaineering, backpacking and hiking. Later in life, most of these focused on his native Wales. 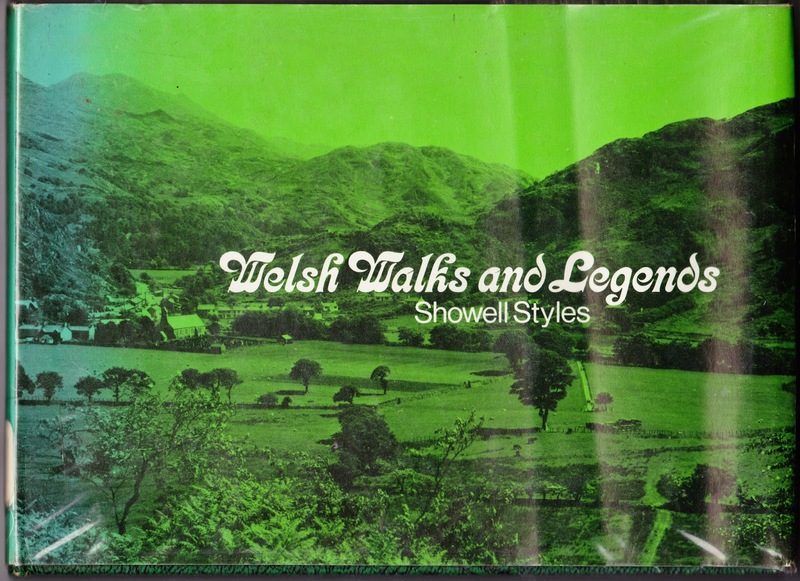 And there was a bonus with my copy of Welsh Walks and Legends: It's an ex-library volume that still has some of its circulation materials intact. If you know me, you know that makes my heart beat a little faster. First up, here's a look at the card pocket and the circulation-stamp sheet on the first page of the book. This book, we can see, was No. 17223988 at the Lancashire County Library, which had its headquarters in Preston, England. (It appears that all of the Lancashire libraries are now controlled and operated by the Lancashire County Council.) 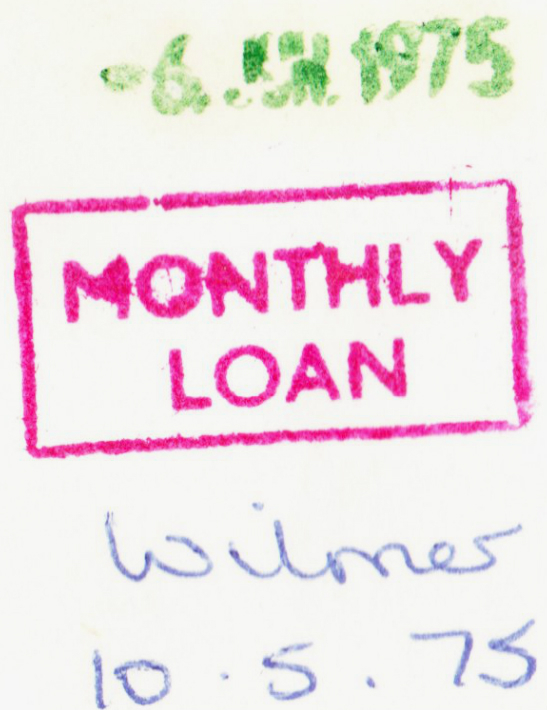 The colorful and haphazard array of stamps has dates ranging from July 1973 to August 1990. And here are the two cards that were still in the card pocket. For perspective, the first is the size of an index card and the second is only the size of a credit card. 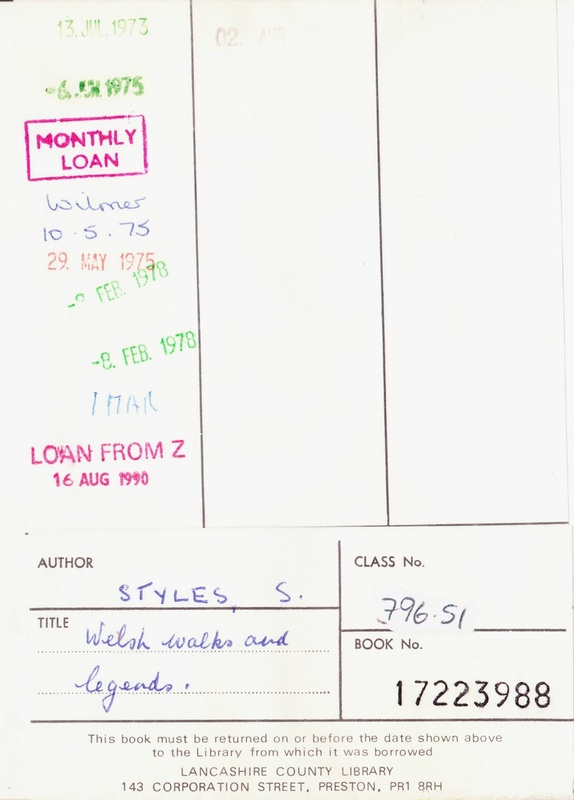 Of minor note: There seemed to be some confusion regarding whether Styles' book belonged in 790 classification (recreational & performing arts) or 796 classification (athletic & outdoor sports & games) under the Dewey Decimal system. I'm not sure either one is a great fit for a book that's half folklore and half hiking guide. 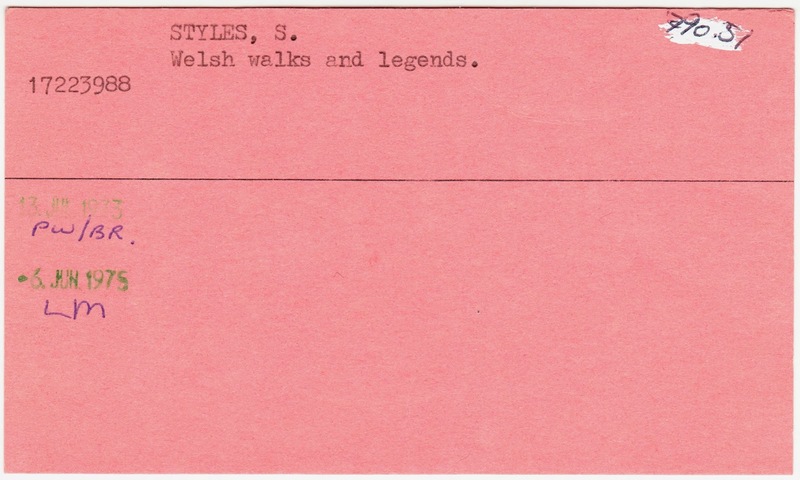 Styles, it seems, created his own genre with Welsh Walks and Legends. Pennsylvania College's old library copy of "Flatland"
1. Intrigued? Check out Footprints of the Welsh Indians: Settlers in North America before 1492 and/or dive into the Wikipedia article "Pre-Columbian trans-oceanic contact theories." 2. 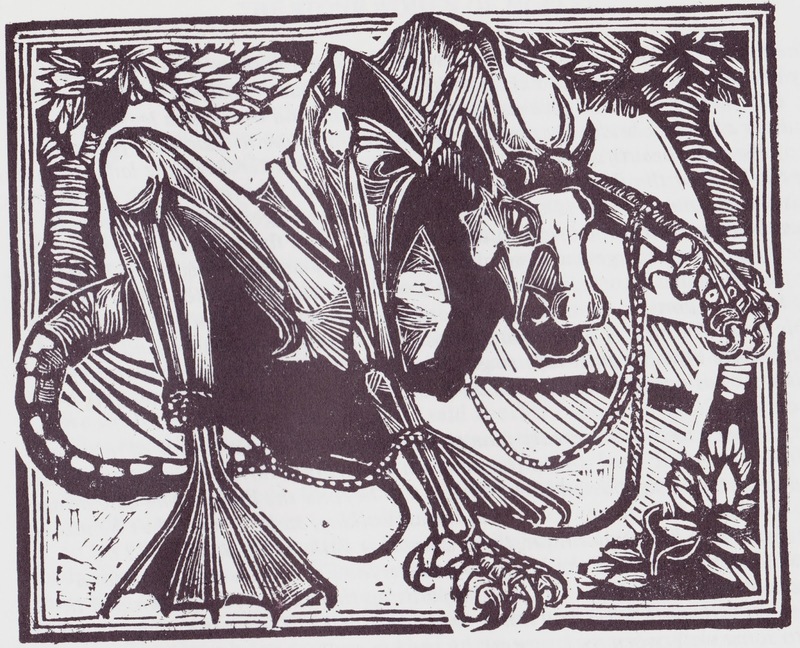 Sarah did not enjoy Gelert's tale. She thought Llywelyn the Great should have used a little more common sense and some investigative skills before slaying his beloved dog. OK, we're going to need the art experts out there to step forward. I'm easily impressed by artwork. 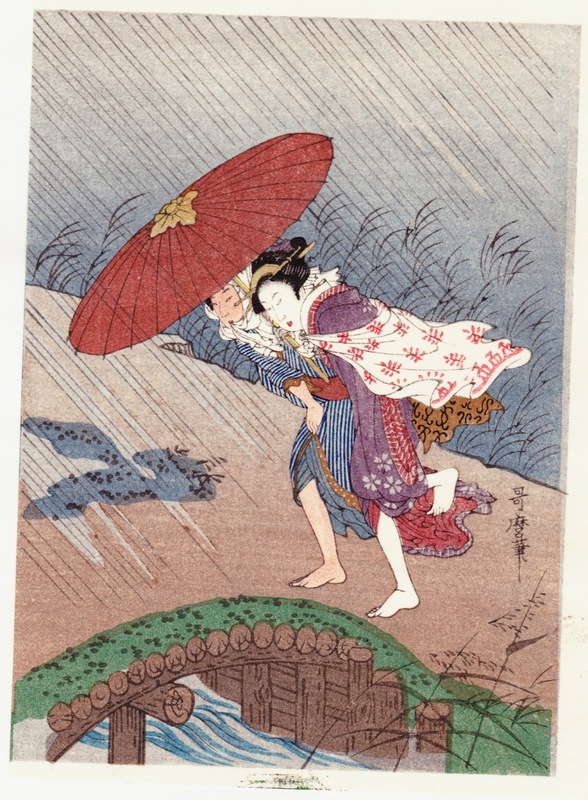 And even with this just being a print, it's a really striking image of two Japanese women, bent forward and trying to stay under their umbrella in a rainstorm. 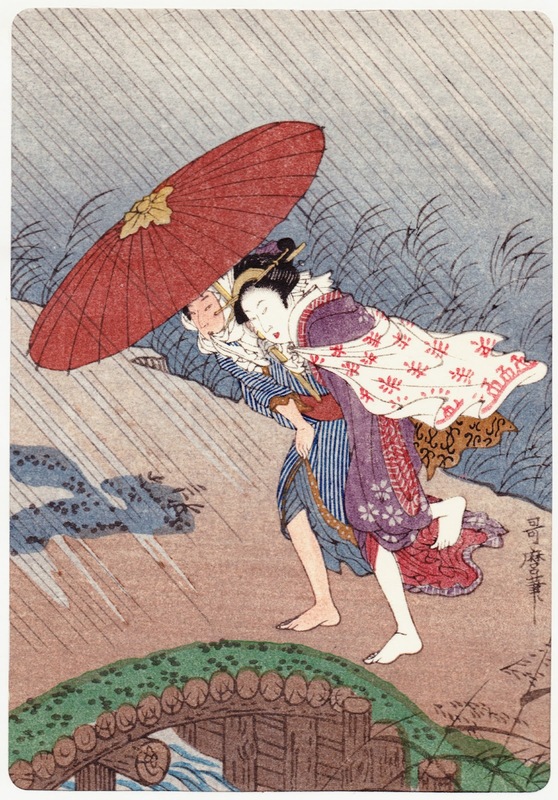 One of the women is clearly a geisha (though it seems odd that her legs are white, too). There's a signature on the right-hand side of the print, but I can't read Japanese, so we'll need some help there, too. A Google image search didn't turn up anything helpful. Shown below is the full image underneath the matte. As you can see, a good bit of the artist's work has been cropped out. "A long-gone motor inn, longer-gone ancestors and a sketch"
2. Speaking of inches, I'm currently reading Whatever Happened to the Metric System by John Bemelemans Marciano. The author was born in the same year as me (1970), and so we have that shared experience, unique to our generation, of being told in grade school in the late 1970s that the United States was going to the metric system and we had better get ready for it. And then we didn't. Good morning! As I get back into the groove after a few days of working and mowing and working some more, here's a funky old postcard showing a place that looks like it could be straight out of a Star Trek (TOS) set. This real-life spot is located in Guadix, a city of 20,000 in southern Spain. The "Libreria Perez Ruiz" postcard is titled "The Caves View" (or Vista de Cuevas). These centuries-old cave homes, carved from tuff (soft rock made from volcanic ash), are known by a number of names, including Barrio de Santiago, the troglodyte cave dwellings and Barrio Troglodyte. 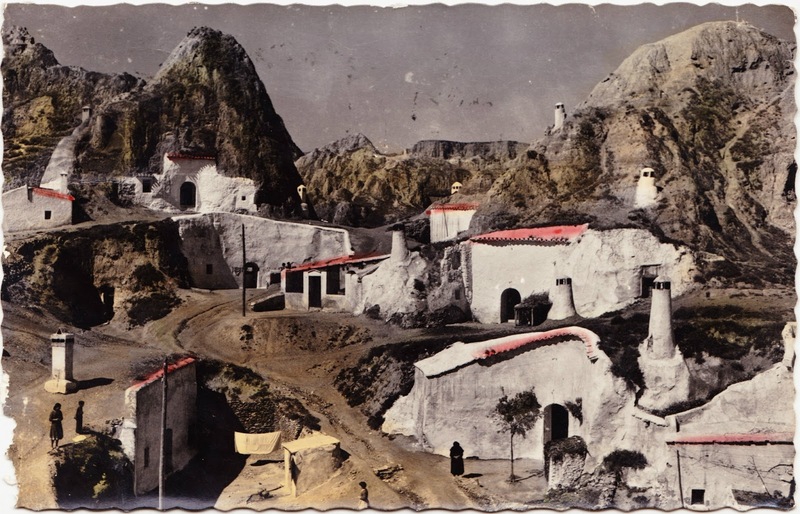 "The most interesting feature of the Guadix area is that many of the inhabitants of this large town live underground, in the southern part of the town, in what are known as cave houses. The jagged ochre terrain and the dazzling whitewashed chimneys and doors of the caves contrast dramatically with the snow-covered peaks of the Sierra Nevada, which loom above. The cave district is signposted on the main street of the town as the 'Barrio Troglodyte'. "You can drive through the cave area, but you should also get out and take a stroll. The 'troglodytes' [are] very friendly people and are also very house-proud, or 'cave-proud', as you wish. If you show an interest in their homes, you will be sure to be invited in to have a look. Ever since the Moorish times, the Andalucians have been fond of living underground because it is the best way of escaping the summer heat waves, and don't be surprised if you are invited in to have a look around. Most of today's cave-dwellings are well-appointed, like any other Spanish home, and some are even quite luxurious, with marble floors, fitted kitchens, faxes and internet connections." If you lived here you could "get away from it all!" Or wouldn't you want to? It was darn hot on July 7 as we drove through on the way to granada. However, there's a breeze in the shade and it cools off at night. An 8 year old budding capitalist sold us these cards & had handfuls of all kinds of foreign coin. Have a good vacation. See you in Sept.
1. And, because of course there is, there's a 2013 Huffington Post article titled "9 Amazing Cave Villages You Can Still Visit."